Before you order a replacement garage door torsion spring, you need to take a few precise measurements on the broken spring. Grab your tape measure, the broken spring and a calculator, and follow these steps. First, measure 20 coils and divide that measurement by 20. This will give you the wire diameter. For example, suppose the measurement of 20 coils is 5 inches. 5 divided by 20 gives you a spring wire diameter of .250. Be extremely precise with your measurements. If the measurement of 20 coils is 4 7/8 inches – a difference of only 1/8 inch – you’ll have a spring wire diameter of .243, which means you need a different sized torsion spring. To confirm your initial measurement, measure 40 coils and divide the measurement by 40.Some torsion springs have a color coding system – green for .243, gold for .250 and red for .225. However, there are two color coding systems and one really isn’t used anymore, so your measurements and calculations with 20 and 40 coils are more reliable. This appears on the torsion spring’s winding cone or stationary cone. For example, P200 tells you the inside diameter is two inches. A different brand of cone may say OMI 1 3/4. This means the inside diameter of the torsion spring is 1 3/4 inches. Measure the Length of the Broken Torsion Spring First, make sure you have no tension on the torsion spring. Measure both parts of the broken spring and add them together. As long as you’re within 3/4 inch above or below the actual length, you’ll be fine. However, be sure to measure the spring only and not the cone. If you include the cone in your measurement, you’ll throw off the balance of your garage door. 3. Is It a Left- or Right-Hand Wind Spring? 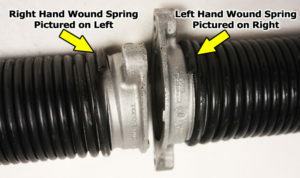 Look inside the broken torsion spring from the side. If the spring is winding clockwise, it’s a right-hand wind spring. If the spring is winding counterclockwise, it’s a left-hand wind spring. As shown in the picture and in the video, another good way to tell is to look and see if the spring is curling around and pointing down at you. If it is curling around and pointing up, it is a sure sign that you have installed it incorrectly. In most cases, the garage door height will be seven or eight feet. You can easily verify which one with a tape measure. If you have a custom garage door height that is taller than 8ft., please give us a call and we will be glad to help get you the correct spring for these taller doors. We encourage you to watch the video How to Measure a Broken Garage Door Torsion Spring to Order a Replacement to ensure that you measure properly and order the right replacement torsion spring.